A year passes. Charles now makes a passable living in London as a French teacher. Charles visits Dr. Manette. During the visit, Charles tells Dr. Manette of his deep love for Lucie. Dr. Manette at first seems frightened by the news, but relaxes when Charles promises that he intends not to separate them, but to share the Manettes' home and bind Lucie closer to her father. Dr. Manette suspects that Stryver and Carton are also interested in Lucie, but promises to vouch for Charles's love for Lucie should Lucie ever ask. Charles has sacrificed his wealth and aristocratic heritage to try to win Lucie's love. Since only Lucie's love keeps Dr. Manette sane, any threat to their bond makes him worry. Charles understands this and promises that his relationship to Lucie won't interfere with Lucie's relationship with Manette. Charles thanks Dr. Manette for his confidence in him, and wants to return the favor by sharing a secret of his own: his real name. But Manette suddenly stops him. He asks Charles to tell him on the morning of his wedding, not before. That night, Lucie returns and finds her father again making shoes. Dr. Manette must have a hunch that Charles is an Evrémonde. By stopping Charles from revealing the truth, he continues to try to repress his pain. But he is not entirely successful, as his return to shoemaking shows. Fyfe, Paul. "A Tale of Two Cities Book 2, Chapter 10." LitCharts. LitCharts LLC, 22 Jul 2013. Web. 11 Jan 2019. Fyfe, Paul. "A Tale of Two Cities Book 2, Chapter 10." LitCharts LLC, July 22, 2013. 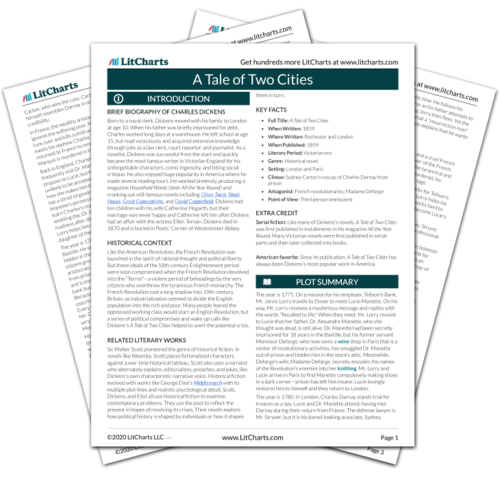 Retrieved January 11, 2019. https://www.litcharts.com/lit/a-tale-of-two-cities/book-2-chapter-10.